Compact doesn't have to mean uncomfortable, and the 2018 Volkswagen Jetta is a case in point. Despite the size of its footprint, you and all your passengers will be comfortable and safe in the Jetta. Compared to competing compact cars like the 2018 Chevrolet Cruze, the Jetta has a more comfortable interior, more active safety features and more powerful engine options. That means the 2018 VW Jetta is the superior choice. Read on to find out more of what makes the Jetta such an impressive vehicle compared to the Cruze — then, just browse our inventory and see which Jetta we have in-stock is perfect for you. You can even schedule a test drive from right here on our site! The base model 2018 Volkswagen Jetta will cost you a little more than a base 2018 Chevy Cruze, but you'll get more than enough additional value in return. On the outside of the Jetta, larger alloy wheels come standard, as do LED daytime running lights and heated exterior mirrors. You'll have to pay for a trim upgrade to get any of those features on a Cruze. On the inside, substantially more rear seat leg room in the 2018 VW Jetta will keep all your passengers happy on your journey. Lastly, with more room in the trunk than the 2018 Chevy Cruze, you'll have plenty of space for everyone's stuff — all in an affordable, compact sedan. 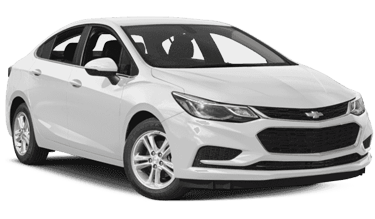 The 2018 Chevrolet Cruze gives you two engine choices, neither of which makes more than 156 horsepower. In the 2018 Volkswagen Jetta, with three available engines including a 2.0L turbocharged powerhouse producing up to 210 horses, you can get the spirited driving feel you demand. Or, opt for one of the smaller engines for maximum fuel economy, or the perfect balance between power and efficiency. Either way, you'll enjoy the turns and endure the bumps even more in the Jetta — a fully independent rear suspension means you get superior ride quality and better grip when cornering. The 2018 Volkswagen Jetta enjoys a variety of safety systems that the 2018 Chevy Cruze simply doesn't have. These include Adaptive Cruise Control, which dynamically maintains a preset distance from the vehicle in front of you, even as it accelerates and slows down. Other features you won't find on the Cruze include autonomous emergency braking and Volkswagen Park Pilot. The Jetta also gets the Intelligent Crash Response System, which will shut off the fuel pump, engage the brakes, turn on your blinkers and unlock your doors as soon as a crash is detected.